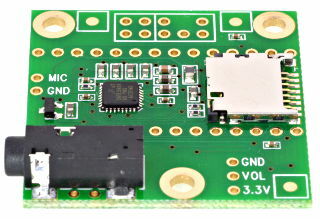 For Teensy 3.x there is an Audio Board ($14.25) which supports 16 bit 44.1KHz stereo input and output. 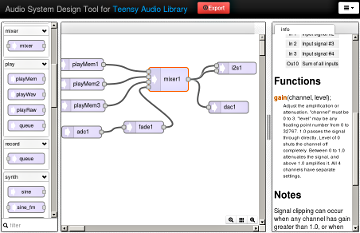 Teensy has a good audio processing library and even GUI for generation of audio processing apps. Frame size can be decreased (in .h file) to provide lower latency. Teensy 3.6 ($29.25) is 180MHz ARM with hardware floating point - which allows even DSP processing using floating point instead of integers. In general, I think that teensy sound generation capabilities are good enough for digital theremin. Hardware timers allow to measure signal period with 60MHz precision. Reference clock may be generated by timers as well. Teensy -> Audio board -> Theremin board may be stacked one into other via headers. It could be a good replacement for next generation Open.Theremin hardware. Dominik, yes, I know that Subscope I have is the basic model and since 2010 you advanced a lot. I wrote about what I have had experienced with the instrument all along, from the very beginning and not due to some recent changes. And you are right it was not necessary to mention the issues with Subscope as the topic is about Open Theremin. I would appreciate if anyone who owns and experiments with Open Theremin may answer my questions. the open-theremin has a very good pitch linearity. and you can upload your own waveforms, turn it easily into a midi controller and it's very small. but if you want to hold a note steady: it's to unstable to become a pro-instrument. Idea for simple extra sensitive Open.Theremin sensor. Instead of oscillator and heterodyne, use simple phase detection (as suggested by dewster). 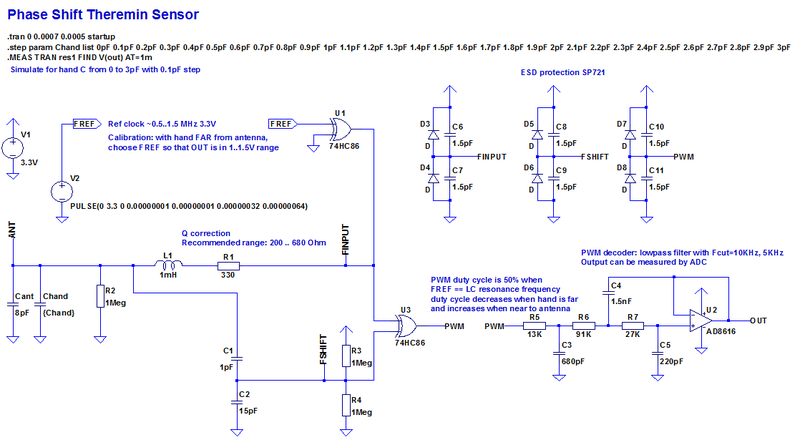 Compare phase shift of reference clock passing through LC tank. 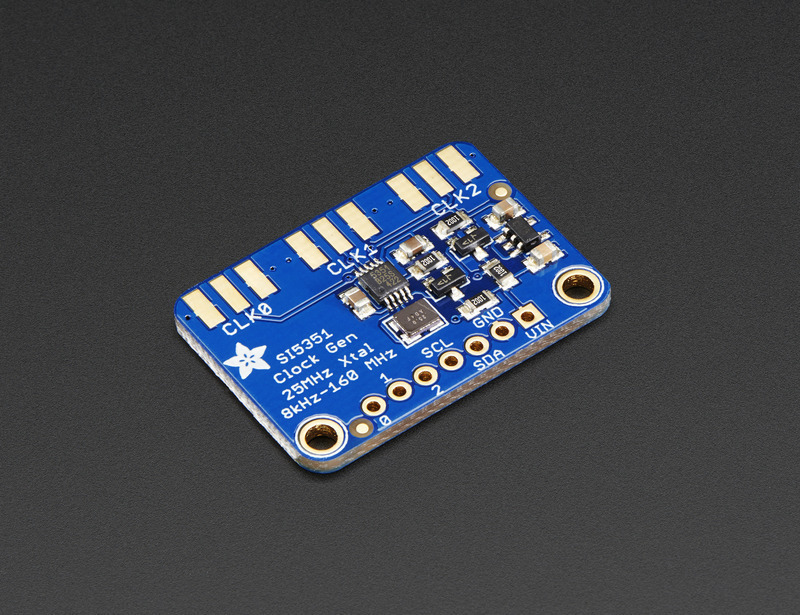 XOR based phase shift detector gives PWM output. 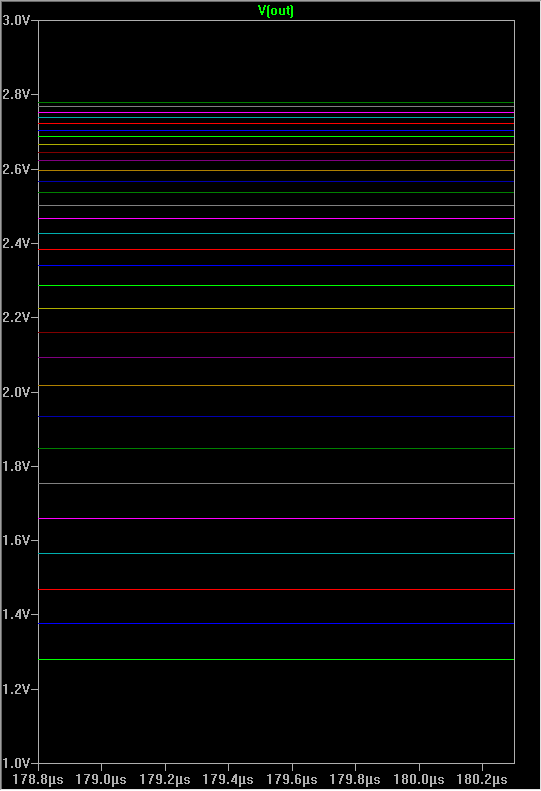 LP filter converts PWM to voltage which can be measured by ADC. 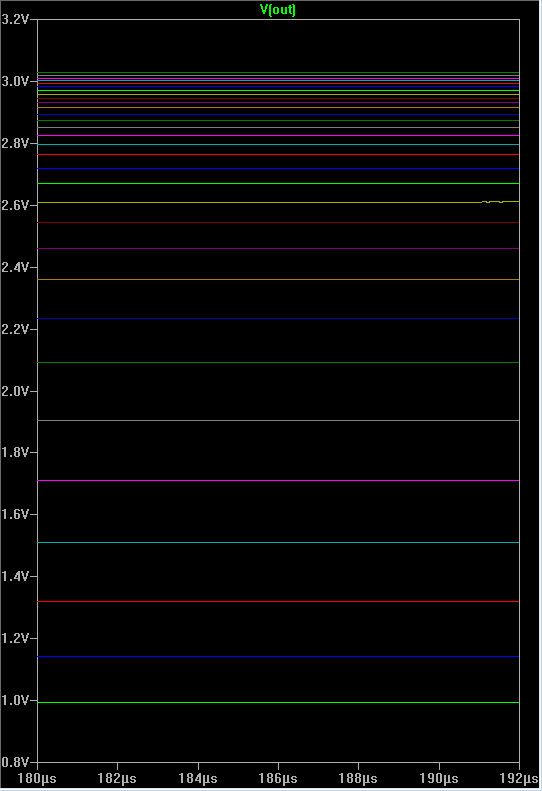 When input frequency equals to LC tank resonant frequency, PWM is 50% duty cycle, and OUT is VCC/2. When hand approaches antenna, OUT increases, when hand distance increases - OUT decreases. Q correction: R1 value (and R2) may be chosen to tradeoff between sensitivity at higher hand distance and near distance. 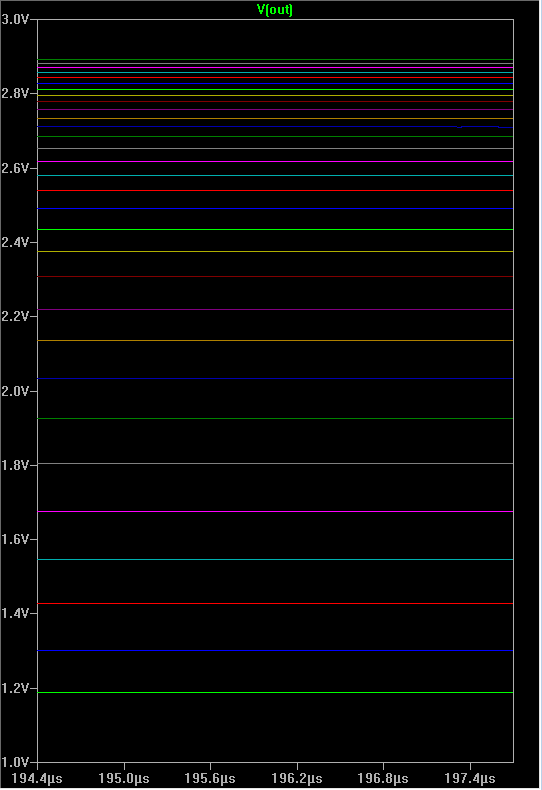 Output voltage depending on R1 (sumulate C_hand changing from 0 to 3pF with 0.1pF steps). 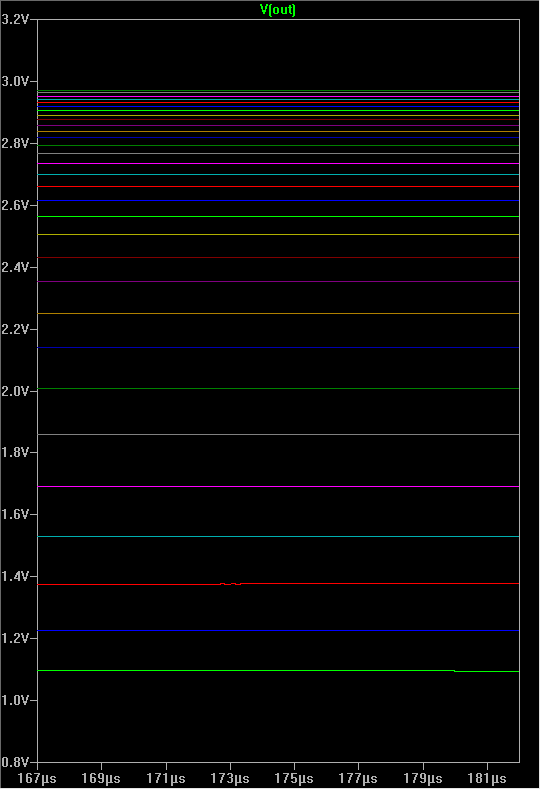 Probably, such R1 and Fref may be chosen than OUT voltage linearly correspond to hand distance. Fine tunable reference clocks are required. For Teensy, internal PLLs may be used to generate reference clocks. Clock Generator: SI5351 with I2C interface. 10bits of Arduino ADC may be not enough. 16bit ADC with I2C interface. All 3 steps may be combined into pre-calculated conversion table on calibration stage - just perform linear interpolation. 2 74HC86 ICs (don't use one for both LC - for better decoupling). Can anyone minimize digital theremin more? Teensy 3.6 has 2 12-bit DAC pins. 12 bits seems too low for high quality, but only when we applying volume control directly to DAC input value. We can use external VCA - using second DAC channel as volume control. Thanks Xtheremin8. So, if I need a portable theremin to play, for example, Vocalise by Rachmaninoff using Electro-Harmonix Stereo Talking Machine, open-theremin would not be a good choice to rely on due to unstability? Correct? sergei, you could try it. maybe it works for your purpose without any problems. i mean, some people seem to have no issues at all with it, judging by some "ave maria" youtube videos. i tried it in many different places, with all the different power sources and grounding solutions and still wonder why, but all i get out of mine are jittered notes.